Our updated guide to playing Control Mage in the Rastakhan meta. 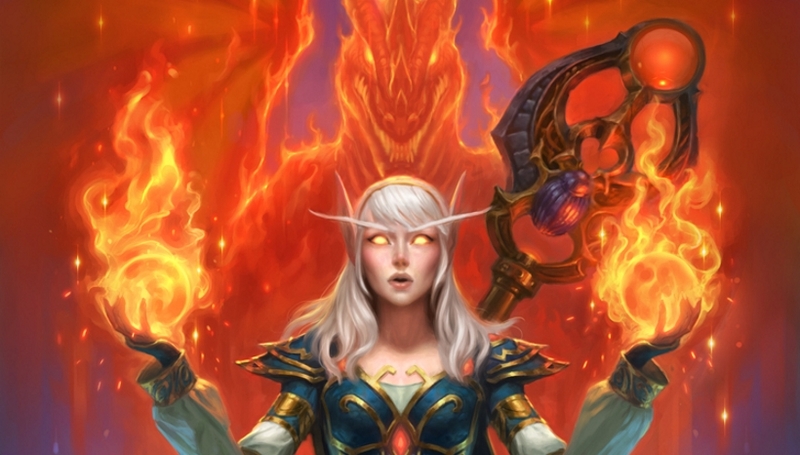 Our Control Mage deck list guide features the best Rise of Shadows deck list for Season 61 of Hearthstone (April 2019). Our Control Mage guide also contains Mulligan advice, card combos and strategy tips. Control - or Big Spell - Mage has undergone quite a few changes since its original incarnation towards the end of 2017. We’ve seen a big part of the deck, Dragoncaller Alanna, fall in and out of favour over time, and she's not currently part of the core version of this deck. What has always stuck around, though, is powerful late-game minions like Frost Lich Jaina and Sindragosa. In our guide to playing this archetype, we've got the best deck list you can use in the current meta. We've also outlined the general strategy involved in playing Control Mage, provided a few Mulligan tips, then created a teardown of all the card combos that you'll find in this particular version of it. That should give you a solid ground in the strategy required to play this huge deck. After some time with the Rastakhan meta, this is the most popular version of Control Mage that's being played right now. There is still a lot of room for change, however, so we’ll be updating the list every so often. It probably won’t surprise you to hear that Control - or Big Spell - Mage is, well, a deck packed full of big Mage spells. Your aim with this deck is to drag matches as far into the late game as possible, where you can use some of the class’s most expensive spells to finish the opponent, or outlast them with Frost Lich Jaina. The deck has definitely fallen down the rankings over the last few months, but if you enjoy playing a heavy control game while devastating your opponent with explosive spells and big minions, then it’s an excellent choice. Early game: It’s all about control in the early game, and setting up for the future. In that sense, cards like Firetree Witchdoctor are excellent. You can also use Stonehill Defender to frustrate aggro opponents in particular. Mid game: As you cross into Turn 5 and upwards, the deck starts to truly come alive. Any concerns of facing down an overwhelming board in the early game can now be wiped out instantly with a Dragon’s Fury or Flamestrike. On the other hand, single targets stand no chance if you direct a Meteor at them. Late game: From this point on you should be in total control of the game. Any last remaining minions can be burnt up for good with Flamestrike, and then it’s a case of using cards like Sindragosa to start building up a late-game board. There’s still more to follow after that, too, if you transform yourself into Frost Lich Jaina. Now, your Hero Power will summon a fresh Water Elemental if you kill a minion with it, and they’ll all be granted Lifesteal to keep you healthy as the late game drags on. 1. Firetree Witchdoctor: You've an excellent chance of bagging the Dragon you need to trigger this minion's Battlecry. 2. Stonehill Defender - A superb tool for shutting down aggro opponents, and even giving slower decks something to think about for a turn. 3. Frost Lich Jaina: As expensive as this card is, it's such a crucial part of your win-condition that it's absolutely worth holding onto as a dead card for the early and mid-game. - Every time you cast a spell, Arcane Artificer will grant you Armor equivalent to its cost. Your opponent is not going to let this card live on their turn, so you want to combo this with your bigger spells in the late-game. - You need to be holding a Dragon in your hand if you want to achieve Firetree Witchdoctor's bonus Battlecry. Likewise, Scaleworm only gains its extra Attack and Rush mechanic if you have a Dragon tucked away. Crowd Roaster is also affected by this requirement. - Gluttonous Ooze will not just destroy the opponent's weapon, but also give you Armor equal to the blade's Attack value. Extra defense is always welcome in this deck! - Try to exploit your opponent's positioning to get the maximum possible value out of Meteor. Smart players will play around it, but you'll also have many opportunities to crush your opponent's dreams! - You need to juggle Health values quite carefully with Frost Lich Jaina. If you ping a minion with your new Hero Power and your target dies you'll gain a free 3 / 6 Water Elemental for the board. You can target your own minions, however, and so sometimes it's worth "refreshing" a worn-out minion with a new one! - You are guaranteed to dish out at least four points of damage when Dragon's Fury is played, as Polymorph is your cheapest spell in the deck. - Keep in mind that the Battlecry damage provided by Primordial Drake damages your own minions as well as the opponent's. Do some work with them first if they're going to die to this play. Many of the key cards in Big Spell Mage are expensive and have very few alternatives, although we’ve suggested some where possible. Arcane Artificer: Paired with your late game spells it can generate some serious Armor to give you more survivability. Prince Keleseth: Can get your game off to a great start by empowering all your other minions in the deck with a + 1 / + 1 buff. Consider replacing with a Doomsayer or Raven Familiar if you don’t have the card. Gluttonous Ooze: With the multitude of decks in the current meta running weapons this is a wise tech inclusion that will also generate you some extra Armor. You can run an Acidic Swamp Ooze if you don’t own this and are running into lots of weapon-heavy decks. Arcane Tyrant: With all the expensive spells in the deck, this is guaranteed to cost nothing at some point setting you up for a powerful tempo play. Some versions are running Astromancer in its place. Dragon’s Fury: Eight of the ten spells in this deck cost five Mana or more. That’s usually enough for a full board clear. Zilliax: A impactful and multi-purpose Rush minion that can help you catch up against aggro in particular. A handy inclusion but not massively necessary if you want to run an additional Saronite Chain Gang instead. Meteor: Almost excessive single target removal. You can try running a Vaporize for a similar effect, but opponents can more easily find a way to play around that. Jan’alai, the Dragonhawk: You’ll be doing a lot of damage with your Hero Power throughout the game, so you should be able to activate the bonus effect easily to give yourself another win condition with Ragnaros the Firelord. Sindragosa: A big minion to drop on Turn 8 that also comes with the added value of summoning two Frozen Champions that can give you a pair of Legendary minions into your hand. Decks that don’t run it seem to prefer Pyroblast instead. The Lich King: A big body to drop on the board on Turn 8, plus some of the Death Knight cards can be put to excellent use. Dragoncaller Alanna: Another essential part of the deck that’ll summon an army of 5/5 dragons depending on how many big spells you’ve played throughout the current game. Frost Lich Jaina: Gives you some ridiculous lasting power in the late game by converting your hero power into an elemental summoning machine. Oh, and they now have Lifesteal as well, so you can survive into fatigue! @vladoonet Hey thanks for letting me know and sorry about that. It should be working now but please let me know if you're still having any trouble with it. Hi folks, this is now updated for the mid-November meta. Apologies this one's been gathering dust a bit for a while now. It's been off our radar but we've now got a closer eye on it. Thanks for your patience while we got caught up on things. It might be a little top heavy but I enjoy the power level because it feels like there's lots of control in the meta right now. I have been underwhelmed with Geist recently as Druid seems to have backed off a lot, it should probably be cut for ooze. I know some of you want to see the old deck list preserved, so here it is! Keep in mind as well that any comments appearing above this one refer to older versions of the deck. This Deck is utter trash in the current meta. Gets crapped on by any priest,druid or shaman deck and only has very limited use against hunter. works vs paladin but thats it. It's way too slow and doesnt have enough control against very aggressive decks (which are meta right now) and the finisher relies purly on the luck of the draw.other tierlist sites don't even bother with this deck in any tier at all. I can't even rise past rank 18 right now while my midrange f2p hunter deck got me to rank 10 last season easily. @iVoltage Hey! I'm so sorry for missing this comment, the article must have fallen off the home page quickly around then. If you ever need to buzz me for anything, it's best to use@Bedders so I get a notification. As for your question, it's kind of a weird replacement from a Mana curve perspective but Acidic Swamp Ooze will give you the weapon removal effect, although you won't get the extra card(s) provided by Harrison Jones. I've added that replacement option to the update section of the guide this month, in case it's a question that occurs to someone else! any replacements of harrison jones? This deck is terrible, the only time you actually do well is if you get mana wyrm and curve well. Bad match ups to almost all decks except the slow decks like taunt warrior. 100% do not recommend, waste of dust. I disagree mate, i also used up lots of dust to make this deck, i am currently at rank 6 now. I have been playing alternatively with this deck and my secret mage and i think i can push it to 5 this season. Lets see how this ends up going, but so far i am extremely pleased with my results. So keep practicing and learning the deck, its the only way to thrive. Good luck mate! I've wasted so much dust on this garbage deck -.-"
What the hell is strong in this deck anyway? The useless 6+ cost cards when at turn 5 your dead 90% or what? The rng that literally gives the worst possible spell every single time you get them? @BetaMomb Glad it's working out for you! I should play it more but it's not my favourite kind of archetype. Definitely strong as though. I know it's not a big deal whatsoever but Medivh the guardian is classed as a Mage card according to this guide. Looks like a cool deck, shame I don't have troggzor. A bit surprised to see the illuminator, it seems like ice block has been added just to give the illuminator a long-lasting secret, but possibly those two cards could be swapped out with higher value cards.